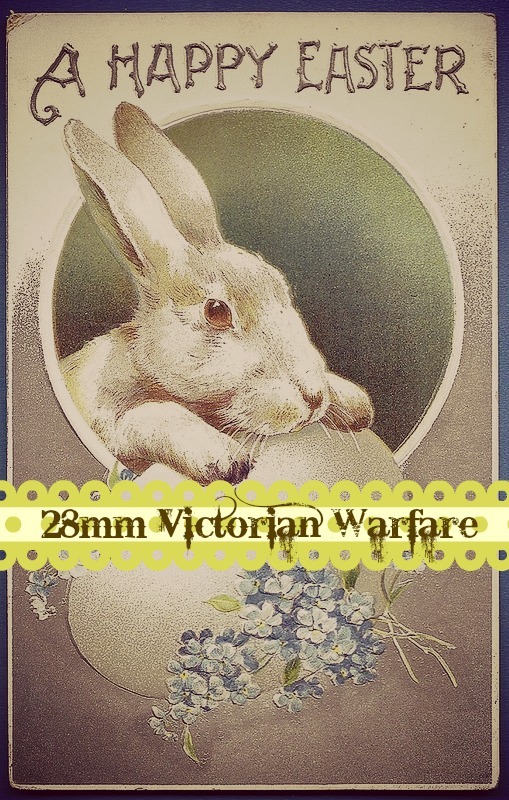 28mm Victorian Warfare: We have some winners! My apologies for the unnecessarily cryptic address, (I should also point out that there are no spaces either!) but I am led to believe that this helps to reduced the likelihood of additional unwanted spam, something we are already plagued with. With regards to the two winners of the 'Command Stands' if you use the same email to open up a line of dialogue, I'm sure we can soon sort out what it is I can paint for you. A huge 'Thank You' to all that entered and helped to celebrate this humble web log's second anniversary; drum roll please! 5. Finally the 'Command Stands'! These have been scooped by Mike Reynolds - The Dark Templar and Dave D - One Man and his Brushes. I am a little concerned that this could mean an unholy alliance of Cowboys and Aliens! My congratulations to the winners and my commiserations to those that missed out this time, I'm sure there will be more opportunities to bag a prize in the future. Congrats to the winners and to toy for running the competition. Best Wishes Clint. Happy Easter and congratulations to all the winners. Happy Easter to you too Andrew. Well done to all the winners apart from Fran....of course! I can see this been problematic! Winner, winner chicken dinner, I'd like to thank my parents, the academy, Pamela Anderson and of course Michael! That was the first time I've been included in the same sentence as Pamela Anderson - thank you! That is very kind of you Tamsin. Congrats to all the winners. Nice one Michael! Happy Easter to you also. Congrats to all your winners and thanks for the comp. Happy Easter to you too Sir. Yeehaaar! I'm a winner, thanks ever so much Michael, I shall get a few cowboys rounded up for ya! Oh goodness I me, I was worried that might happen; very many congratulations nonetheless Dave. A Happy Easter to you too Simon. Very sporting of you Sir. You are more than welcome Mr. Taylor. wow I won, I won. well my son will have really as the sticker book is for him. You are more than welcome my good man. Congratulations to all the winners. Have a Happy Easter Michael! A very Happy Easter to you too Anne. Michael, wow.....I'm pretty speechless. I've dropped you an email, but I just want to say a huge thank you for running the competition and for your great generosity. Thanks again! Sidney you are more than welcome Sir. Wow… can't ever remember winning anything before until I joined the blogsphere. Thank you so much Michael for running the competition. Couldn't have gone to a better chap and phew! Thanks a lot Michael for running such a great prize draw.